What does Duterte mean for the Philippines economy? Unofficial results in the Philippines show that Rodrigo "the Punisher" Duterte will be the country's next president. 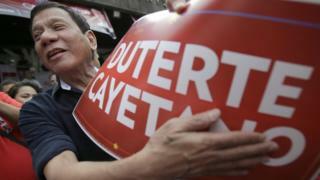 Why have Filipinos chosen him and what does it mean for the economy? From an economic standpoint, it's hard to understand what Filipinos have seen in Mr Duterte's plans for the country. For one thing, he doesn't appear to have any - and if he does, he certainly didn't talk about them in his election rallies. But to be fair to him, neither did any of the other candidates, or not very much at least. The Philippines is one of the "rising tigers" of South East Asia, clocking an average of 6% growth over the last few years under President Aquino's administration. Foreign direct investment has quadrupled, tax collection has improved and at least 4 million new jobs have been created - admittedly far too few in a country of 102 million people. But people I spoke to on the streets and in the markets told me they weren't feeling the benefits of that growth, and that they were fed up with the status quo. Just imagine for a moment if you can, what it must feel like to sit in the back of a dilapidated and creaking train for two hours to get to your office, and then to be paid just enough so your family doesn't go hungry, only to fight your way back on to that train at the end of your day and sit for another two hours to get home. Imagine, if you can, what a life spent overseas saving up money for your family back home must feel like when you return, only to find that your marriage has broken down and your kids don't recognise you? Or to run into a cop at a street corner, and know that the only way out of a lengthy ordeal at the police station is to pay a quick bribe so that you won't be late for work? And then imagine the anger, the frustration and the resentment you might feel if you looked at the sprawling malls and tinted air-conditioned cars and saw that there was a very clear economic divide in this democratic country - the haves, and the have-nots, the folks who can get out of paying bribes because of their connections, and those who have no choice. Imagine all of that, and then you'll understand why Mr Duterte is the front-runner in this race. The statistics are stark, and bleak. Experts say anywhere between 40% and 80% of Philippine legislators are connected to political dynasties with vested interests. A handful of the families control almost all of the country's wealth. And perhaps the bleakest, starkest statistic of all: 25% of the population lives under the poverty line - a figure that hasn't changed much in two decades. So it shouldn't come as a surprise then that Filipinos have chosen Mr Duterte's crime-busting, tough-talking, action-oriented ways over the current administration's candidate Manuel Roxas. Some human rights activists have sounded a note of caution about Mr Duterte's controversial style - comparing him to the Philippine's previous authoritarian leader Ferdinand Marcos. But for many young Filipinos, Mr Duterte is appealing precisely because they don't remember what it was like to grow up during the authoritarian regime of Ferdinand Marcos - they're nostalgic for a past they never lived through. But here's the rub: the past always looks better than the present. For one thing, dead men can't speak. The Marcos regime resulted in massive debt and high levels of unemployment, and was characterised by "it's a who-you-know" style of economic governance. The economy was run by handful of friends and families - and if you weren't in the know, you didn't get the "mates rates". There's no indication that Mr Duterte will be anything like the Marcoses. If anything, he says he will crack down on corruption - those promises have endeared him to voters. But foreign investors fear that he's a wild-card, and no-one knows what he plans to do with the economy. He has a tough task on his hands if he is to convince them and show his fellow Filipinos that he is truly the right man for the job. The Philippines has made impressive gains in the last few years and is no longer seen as the sick man of Asia. Mr Duterte must ensure that he pushes forward with economic reforms - or else the past could very much turn into the present.